First week in March and we are 50% of the way through the movie goal for 2016. So far, it's been an ok season, but as it turns out, they can't all be winners. The Lady in the Van, finally came to town - well two weeks ago. But we just got around to seeing it this last weekend. We've seen previews since maybe last October or November. Metacritic gave it a 70%. Rotten Tomatoes gave it 93%. That's quite a range. In terms of a test, that's C or an A-. It's safe to say, my percentage is equal to or lower than Metacritic. First off, there should be laws when it comes to previews. I always expect the trailer to make the movie look better than it actually is, but to make a movie out to be something it's not is completely different. The preview made Lady in the Van look like a light-hearted comedy about an eccentric woman, but you know what? There is little funny about being homeless, mentally ill, incontinence or having dementia. I suppose it is much more difficult to lure audiences in with that premise. There were a few lines that made me smile a little, and zero that made me laugh - though for the 27 seconds that James Corden was in it, made it a little better. And Frances de la Tour is always always always welcome. And you never see Dominic Cooper enough, though de la Tour and Cooper were both in the playwright / screenwriter's Allen Bennet's History Boys, which was a play and movie that came off far far better than this. It's not to say that Maggie Smith and Alex Jennings don't do a good job, but I think the material itself drags them down.....and allegedly Smith played this role on stage back in 1999. I liked the neighbors - the secondary characters - much more than the main ones. When it was over, both 710 and I shrugged. We joked that seeing Son of Saul would have provided more laughs. Perhaps if we went in with a better inkling of the actual movie / subject matter other than the two and one-half minute clip of quips we might have walked out differently. On the other hand I also heard on the radio 'The History Boys' with the original theatre and film cast, before the film came out. I didn't care for it that first time. It needed the film to make me appreciate how good the play is. 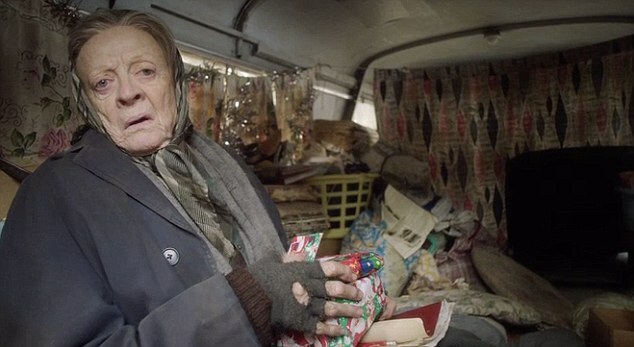 Btw: Not only are De La Tour and Cooper (as well as Corden) from 'The History Boys' cast in this 'Lady/Van' film, but other (all?) the other boys too, making brief appearances. Saw the play. Saw the film trailer and they all seemed to be hamming it up. Will give it a miss. Spouse has been talking about this since hearing an expose on NPR. Glad I read your review so I won't make the mistake of going to see it!